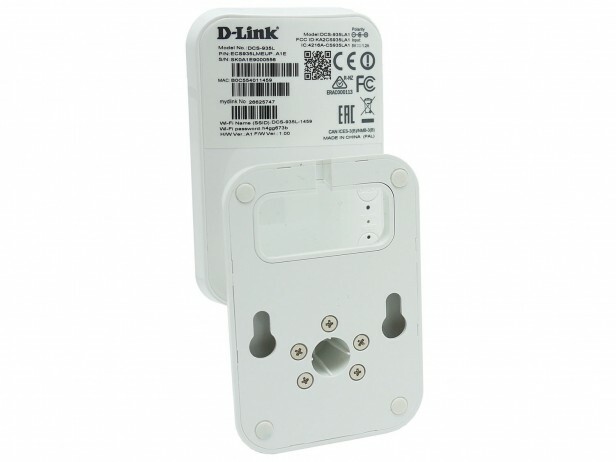 What is the D-Link mydlink Home Monitor HD? Part of the D-Link mydlink Home range, the Monitor HD (D-link DCS-935L) is a wireless IP camera that’s ideal for basic home surveillance. 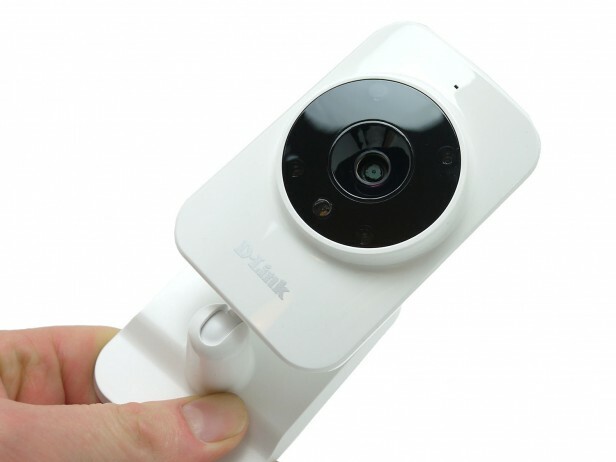 It supports 720p recording, has a nightvision mode, and can be used to trigger other mydlink Home products if it sees or hears anything – for instance, turning a light on using the mydlink Home Motion Sensor. Also, thanks to the companion app, you can monitor your home from anywhere round the world. Like the rest of the mydlink Home range, the Monitor HD is meant to be as simple as possible to use, and this is something that’s reflected in its design. Its smart white chassis should fit in with most décor while the incorporated mounting arm keeps setup nice and easy. The mount can be used either as a stand or a wall mount, with just a couple of screws required to fix it. The mounting arm uses a ball joint to spin and pivot to face just about any direction you need. The arm is a little flimsy and probably won’t stand up to too many adjustments or refittings, but for a one-time installation it’s fine. Dimensions of the unit are just 60 x 92 x 24mm for the camera and 85 x 58 x 40mm for the stand, so it should fit in quite unobtrusively to most homes. The only real eyesore is the size of the black ring around the lens, which makes the unit stand out a bit more. Equipped with a Micro USB socket, the Monitor HD could be powered by any old Micro USB cable. This is particularly convenient if the unit isn’t near to any plug sockets as it means you can run a long USB cable instead, with none of the annoyance of having to find the right adapter for the power supply. The supplied mains adapter has a reasonably long 1.5m cable – enough if your plug sockets are relatively high up your wall but 2m would’ve given a little extra wiggle room. The Monitor HD’s main feature is its 720p camera. It uses a 1/4-inch 1-megapixel CMOS sensor with a fixed 2.38mm focal length (85-degree diagonal view) and f/2.4 aperture. This makes for a sensibly specified imaging system that should provide sufficient quality images even in low light and for a reasonably wide field of view. The basic image sensor is backed up by four infrared LEDs so that the camera can see in the dark. The stated range of this system is 5m, which is sufficient to see across the other side of most average UK rooms. A microphone is also included and as well as providing a direct audio feed for live viewing and recording it can also be used to trigger the camera if a noise is detected. The camera can also be used to detect motion via the camera. 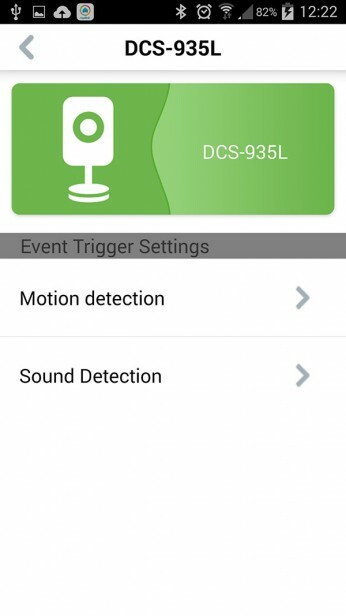 Both are configurable for sensitivity and can be turned off via the mydlink Home app. Speaking of which, the app is what ties the whole mydlink Home system together and elevates all the products in the range above more typical standalone, manually configured ones. You do have to sign up to the free mydlink Home service to get everything running, but it’s a quick and simply process. Available for both Android and iOS devices it works with the Smart Plug, Motion Sensor and the mydlink Home Monitor 360, as well as the Monitor HD. It can be used to both help set up the device and to monitor the products, allowing schedules to be set and rules to be made that cause one device to trigger another. For the Monitor HD it can be used to view a video feed, turn the unit on/off, adjust noise/motion alerts and more. It’s a very neat system… when it works. Rounding things out on the feature front, on the back of the camera are buttons for WPS – the automatic system for connecting devices to your Wi-Fi – and a direct mode which allows you to connect straight to the camera, rather than joining it to another network. There’s also a reset button and status LEDs. We were all set to be as impressed by the Monitor HD as we were by the Motion Sensor and Smart Plug, however the Monitor HD came a cropper straight away. 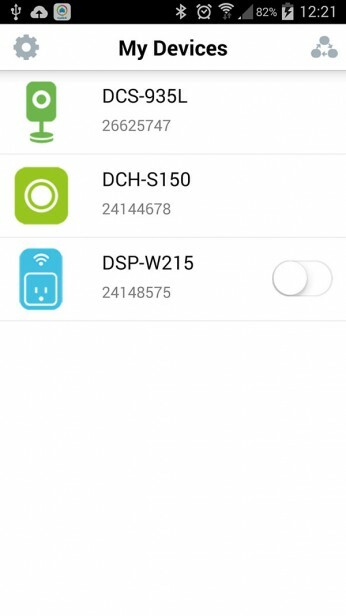 The QR code-based system for connecting the mydlink Home app to the device that had worked so well on those other devices just plain didn’t work on this occasion. Although the app detected the Monitor HD it just crashed when trying to save settings to the device. Our first few attempts to connect via WPS instead also failed, so instead we got the laptop out and connected to the camera manually – after resetting the camera to default – then logged on to its web interface and changed settings that way. Even this, though, didn’t have us entirely up and running, as the app still didn’t see it. Indeed, the web interface and app have very little crossover – the two are quite different in their styling, layout and the options on offer. Anyway, we finally got it up and running and were initially impressed by the app experience. The interface quickly loads a live feed of your camera, and there are on-screen buttons for turning audio on and off, snapping a picture, switching between night and day modes (or setting it to auto) and bringing up an information overlay. Hop into the settings menu and you can enable and adjust the sensitivity of motion and sound detection. 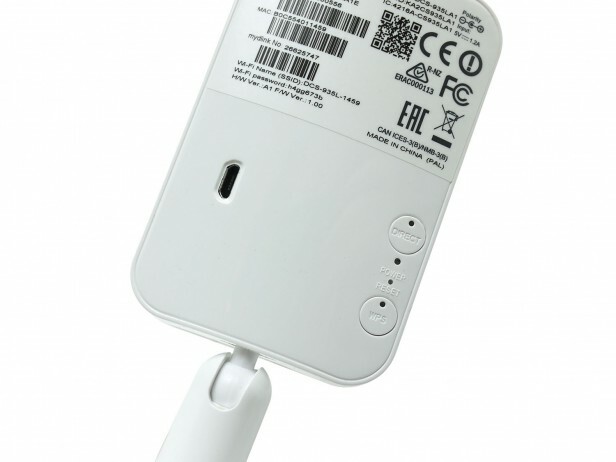 These can then be used to trigger the mydlink Home Smart Plug to turn on or off and it’ll send you an alert. However, we were truly amazed to find that the app doesn’t offer the option to have the camera automatically record a clip, whether motion is detected by the camera or another mydlink Home appliance. This suddenly makes the whole system rather less powerful than it otherwise could and perhaps should be. Indeed you can’t actually record video using the app at all, which is a real disappointment. What you can do, however, is use the camera’s web interface to automate recordings and still image snapshots. These can be configured to record for a few seconds before and after the triggering event and the results are emailed to you. It’s a bit of a faff to setup but it’s good to see the power user option is there if you know what you’re doing. As for the quality of footage, we were generally impressed. Overall detail is of course limited as, although technically HD, 720p isn’t exactly a huge resolution when it comes to trying to make out an intruders face for instance. Jpeg compression is also very evident and the dynamic range is quite narrow, with darker areas being crushed into complete blackness. Overall, though, it’s still quite sufficient for most purposes and even in low light it copes well. Switching to night mode and the range is impressive, with the LEDs easily providing sufficient light to fill a typical 3 x 4m bedroom for instance. Inevitably the centre is brighter than the surrounding area but coverage isn’t too bad at all. Should I buy the D-Link mydlink Home Monitor HD? The Monitor HD is a very competent general-purpose home surveillance camera. It’s small, provides good-quality footage and has a night mode with a decent range. The fact that it’s a bit temperamental when being set up with the mydlink Home app is a bit annoying, and the lack of remote recording through the app is even more so. However, it still does all the recording functions you’d expect through its web interface and otherwise the app is excellent, providing an easy way to keep an eye on your home wherever you are in the world.